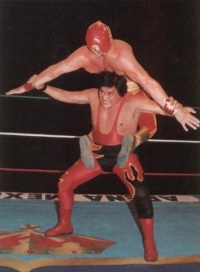 Back rack stretching submission, a signature lucha libre hold known by most who know what they're doing. Credited to Gori Guerrero. There are slight variations in how the move is done; Satanico is holding the victim higher up here than most modern applications of the move. Both the Gory Cradle & Gory Driver are derived from this move. This page was last edited on 28 October 2016, at 10:04.